Samuel Hall's address to the British Association, explanatory of the injustice done to his improvements on steam engines by Dr.Lardner. 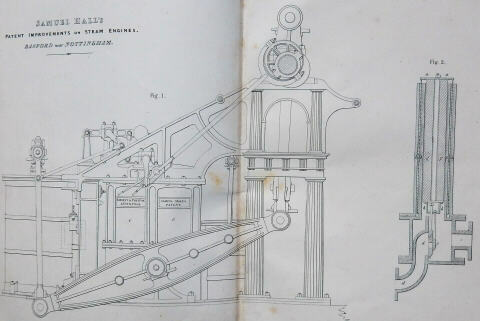 [And] Samuel Hall’s patent improvements on steam engines. Hall’s development of the surface condenser, the concept of which was fully developed in his patent of 1834, marked a major breakthrough in the efficiency of marine engines. The device condensed the steam by passing it through a number of small tubes cooled on the outside instead of injecting cold water into the steam as was the usual practice, which led to fuel economy and the increase of power of the engines. The first of the two items here concerns Hall’s disagreement with Lardner, whom he accuses of maliciously playing down the virtues of the surface condenser both in the fifth edition of Lardner’s book on the steam engine and, worse, in the pages of the Edinburgh Review , where Hall’s name is not even mentioned. The second item describes in detail the leading features of the invention, which could also be applied to land engines, and includes a group of letters from a variety of manufacturers and shipbuilders praising the improvement in the performance of engines fitted with it. There is also a list of engineers who had taken out licenses to build engines with Hall’s condenser, such as Edward Bury, William Fairbairn, Mather and Dixon, John Seaward & Co., Claud, Girdwood & Co., and so on. The plates show the condenser fitted to one of the marine engines on board "Hercules", together with another aspect of the invention, the steam saver, which took the steam escaping from the safety valve back into the condenser. Despite such distinguished endorsements, and the publicity the invention received both from Thomas Tredgold in the 1838 edition of his book on the steam engine, and from several of the witnesses before the 1837 Select Committee on Steam Communication with India, it wasn’t until the 1860s that the surface condenser became standard. The two items were first issued by John Weale as separate publications before being combined here as one work printed in Liverpool where the British Association had its meeting in 1837. 4to. 2 parts in 1. 10pp ; 20pp, 2 double-page litho plates. Boards, orig. wrappers with ms title on upper cover, bound in. Bookplate of Mario and Fiammetta Witt.